A native of Southeast Texas, Andre Harness received his Bachelors degree in Music Performance on Saxophone at Lamar University in Beaumont, Texas. In his time there, he founded The Lunch Combo Jazz Quartet who performed at many significant locations and events in the area. His experience grew out of performing as the lead alto and tenor player for the Lamar Jazz Orchestra, which later expanded to his performing with the Nelson Riddle Orchestra, The Rory Partin Big Band, and the Jimmy Dorsey Orchestra, in Lake Charles, Louisiana, The Night and Day Orchestra in Beaumont, Texas, and The Crimson Orchestra and Primetime Orchestra in San Antonio, Texas. 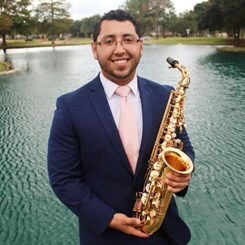 Upon recently completing his studies at Lamar University, Andre currently attends the University of Houston and is actively working toward his Masters degree in Saxophone Performance. Request Lessons with Andre today!